Dimensions 1.50 by 7.25 by 9.50 in. Provides an updated combination of two best-selling cookbooks--The Classic Italian Cookbook and More Classic Italian Cooking--with thirty-five new recipes, revised cooking instructions, and new menus. 40,000 first printing. $40,000 ad/promo. 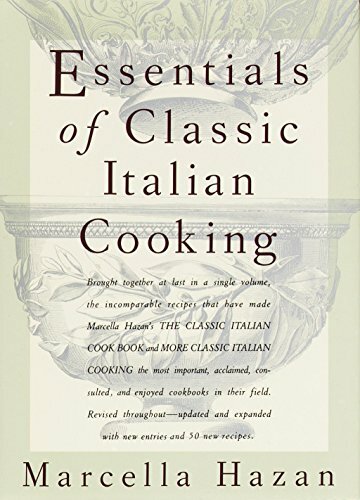 Essentials of Italian Cooking is a culinary bible for anyone looking to master the art of Italian cooking, bringing together Marcella Hazanâs most beloved books, The Classic Italian Cook Book and More Classic Italian Cooking, in a single volume, updated and expanded with new entries and 50 new recipes. Designed as a basic manual for cooks of all levels of expertiseâfrom beginners to accomplished professionalsâit offers both an accessible and comprehensive guide to techniques and ingredients and a collection of the most delicious recipes from the Italian repertoire. As home cooks who have used Marcellaâs classic books for years (and whose copies are now splattered and worn) know, there is no one more gifted at teaching us just what we need to know about the taste and texture of a dish and how to achieve it, and there is no one more passionate and inspiring about authentic Italian food.